With a whirlwind of a summer coming to a close, we've been taking our time soaking up our weekends and settling in at our new place. This past Saturday we woke up early to enjoy a cup of coffee on the roof and I decided to unpack a couple goodies waiting for me from Buffalovely! I came across Amanda Valentine's Instagram, @Buffalovely716, and knew instantly that I had to snag some of her work. I was drawn to the simple, black and white aesthetic plus the phrases and sayings that Amanda creates are are super relevant (and funny) with references to pop culture, politics, music, and more. Before I get to the pieces I chose, I'm sharing some of my favorite items available for sale on Buffalovely right now along with a lil Q&A sesh with Amanda herself! Q: Your current fav piece? 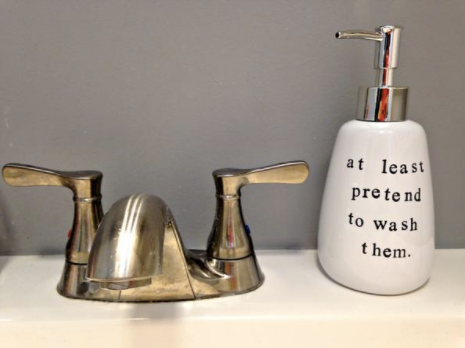 A: I'm pretty partial to the printed soap dispensers! I have one in my bathroom and without fail, anyone that visits my house comments on it! 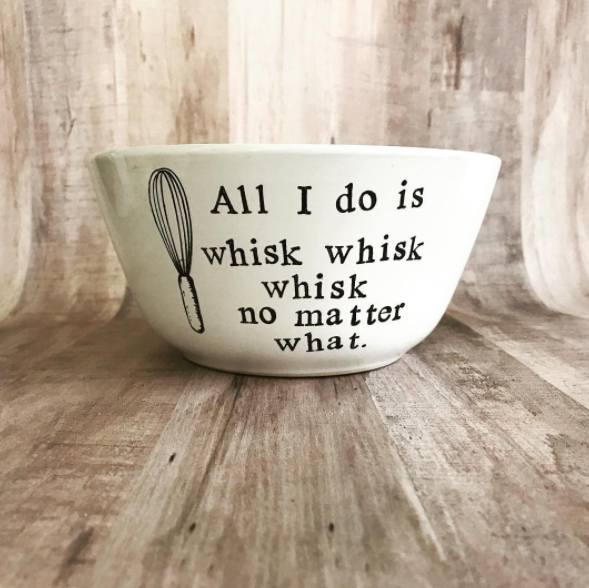 I also love the salt and pepper shakers and the "Bump n' Grind" mortar and pestle. Oh, and the mugs. I can't decide! Q: What about Buffalo speaks to your creativity & sense of community? A: Buffalo has always been home to me, so I love to create Buffalo-inspired items as well. One of my most popular items is my Street Sign Pillow. 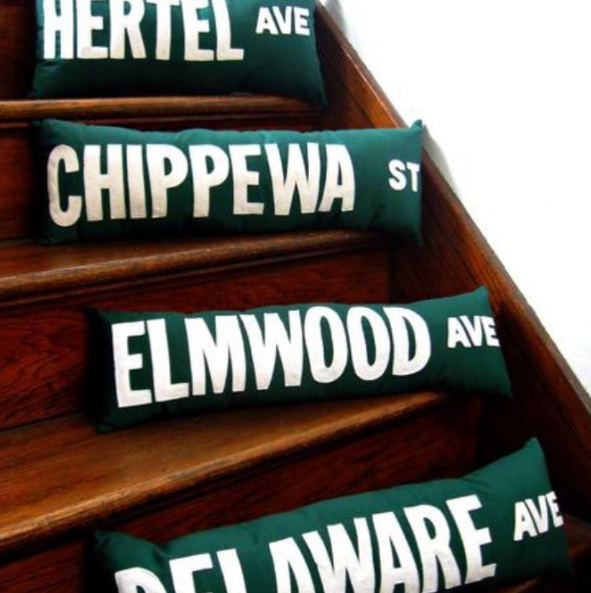 I love to send them to people who have moved away to remind them of the street they once called home and they make the perfect housewarming gift for anyone settling into a new place here in Buffalo. I love when people share stories about that special place in the city that speaks to them. I feel very lucky to be a part of creating such a special and meaningful gift. Q: You often donate a portion of proceeds to charity - can you tell me more? A: I donate a portion of the proceeds from some of my politically-driven items to the charity/cause of the customer's choice. Recently I did a promotion where 100% of the proceeds went to either Planned Parenthood or the ACLU. We raised $238 in under 2 days so I was really happy to see so many people willing to donate to such a worthy cause. If you haven't yet, head on over to Instagram and check out @Buffalovely716 for yourself! I'd love to know what your fav pieces are! I received free and/or discounted items in exchange for this post. All opinions are my own. Hello, July! Goodbye, July! WOW what a month you guysssss. Back to the move! Jake and I have moved a total of 4 times now and I must say...we're getting pretty good at this packing thing. Three flights of narrow stairs on the west side be damned...we got everything out! We agreed that next time, though, we're hiring movers because WOW are we tired and sore. We purged 4 years worth of "stuff" that somehow always seems to accumulate and streamlined our possessions to match our new modern "loft" decor. Our new place is located in downtown Buffalo which isn't far from where we were previously (on the West Side, right near Essex Pub) but it already has a totally different vibe. I know I'm really going to miss the walkability of living just outside the Elmwood Village but I am so excited to explore the downtown area! Even more so now that Jake and I both live AND work downtown - talk about an ideal commute! The restaurant and happy hour scene is already calling my name plus we've got a rooftop patio that I'm hoping to turn into Club Taylor (I go by Lil Fangs) most nights. Consider this your formal invitation. My mind is racing with the potential for this space. I've been pinning like a mad woman and Jake and I have a goal to blend our two styles while keeping a cohesive feel. I tend to lean pretty heavy on an eclectic & Mid Modern Century aesthetic (give me all the plants, twinkle lights, macrame, wooden furniture, neon signs, velvet chairs, floor poufs...did I mention plants?) while Jake leans toward clean lines and a museum-like modern feel. Also, while he doesn't always display it, I make sure his handmade art is prominently hung (he always says I hang his paintings before they're finished but to me they're perfect every step of the way)! All of that to say, we're one night in and my boho ways mayyyyy have crept their way temporarily in to the corner ;) Let's call these the "before" photos, eh? I am totally open to suggestions for this space! We're dealing with an open concept living space + 1 bedroom / 1 bath with *very* high ceilings so a gallery wall including large-scale pieces is a must. I am also determined to include as many locally made goods as I can in our new space! Buffalo has a huge creative community and I'm on the lookout for new art, furniture, beauty products, and accessories. Any suggestions? Send 'em my way! And now...back to unpacking! Stay tuned!